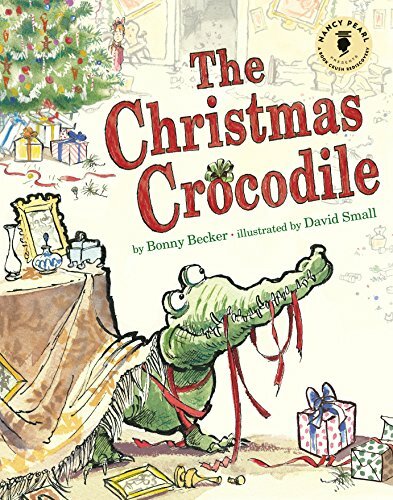 From Caldecott-winning illustrator David Small and bestselling author Bonny Becker, an unforgettable Christmas story that will leave the whole family giggling. When Alice Jayne finds a crocodile under the tree on Christmas Eve, her family goes into an uproar! The Christmas Crocodile doesnÃ¢ÂÂt mean to be bad, not really, but soon he is eating up ChristmasÃ¢ÂÂfrom the dinner roast to the left stove-top burnerÃ¢ÂÂ¦even the Christmas tree! Everyone has an opinion about what to do with him. Uncle Theodore suggests they send him to Africa, Father recommends the zoo, and Aunt Figgy mentions an orphanage. But Alice Jayne thinks the Christmas Crocodile deserves a real family. Can she find him a new home? And will she and the family survive till Christmas morning, with that naughty crocodile gobbling up everything in sight? About: From Caldecott-winning illustrator David Small and bestselling author Bonny Becker, an unforgettable Christmas story that will leave the whole family giggling. About: A very hungry crocodile is mistakenly delivered to the wrong address and thoroughly disrupts the Christmas celebrations of Alice Jayne and her family.